Adam is annoyed that their smooching on the backseat of the limo cost him his job. He wonders where he can get another part time job that will allow him to study with his uni work. Caroline tells him she'll enquire into a job for him in room service at Lassiters. 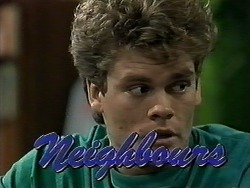 Cody arrives to see Todd as Gemma heads over to check on Matt and Aidan to make sure they're not fighting one another. With Todd announcing that he's heading down the speed-way with Jim, Cody mentions that she might go and see Melissa. Todd knows it's to find out what she's having for dinner, and Cody admits she hasn't told her parents yet about her decision to be a vegetarian. He wonders if she's still hiding food in her room, but she informs him she's stopped. She admits that she hasn't yet eaten a meal today, but he has to go, so she promises to tell her parents that evening. Matt comes through with some bedding for Aidan, and asks Gemma if she's still up for their romantic meal out that evening. She wonders if Aidan will be okay on his own and decides it might be best if they cancel their meal. Matt isn't so keen on the idea, but seeing Gemma is concerned, offers to cook up a chilli for them all here. Caroline apologises to Adam for not being able to organise him a job with Paul at Lassiter's, probably because Helen spoke to him first and Paul doesn't believe he'll be committed to his job if he can't to his previous one. Adam wonders what his other job options could be before changing the subject entirely and inviting her to the family roast. Cody watches on as her parents prepare the roast. Pam teases Doug and asks Cody how much she'll want. Cody tells them she doesn't want any and has been invited to Melissa's for tea. 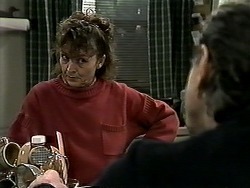 Pam tells her that from next week she wants her to spend more mealtimes at home as she's been eating out too often. As Pam and Doug head outside, Cody sneaks some food from the kitchen. 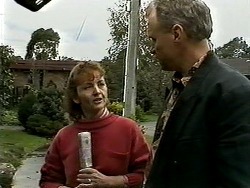 As Doug, Pam, Adam and Caroline dig into a roast, Doug offers Adam a job down on the building site. Adam isn't so keen, as Pam reminds him how he used to want to join his dad and turn it into a family business. Adam kindly declines, saying he'd rather look elsewhere. Matt has cooked them all chilli, but it's a dish Aidan isn't used to and finds it too hot to eat. Gemma isn't impressed, but the lads soon start talking about school, and Matt is quite supportive of Aidan's choice with his studies. He tells him he'll be able to work out where his talents lie and then know which direction to head in. Cody arrives to find Todd guzzling down soup. She is starving, so he offers her some, but it contains ham, so she turns it down. He starts eating it right in front of her, just to annoy her. Aidan talks of getting some more tuition when he gets home. Matt asks him if he likes cars, and they start talking of a way he could do an apprentiship to become a mechanic. Gemma leaves them to it as they start raving on about cars. Cody arrives home and starts raiding the fridge once again. Pam tells her to stop eating so many biscuits, before heading to bed. Adam wonders what she is up to, and when she momentarily faints, he rushes to help. She tells him not to tell their parents about the incident. Gemma arrives to find out that the lads stayed up talking to the early hours. Aidan comes through with news that the bus leaves before the bank opens. Matt offers to loan him the money, and to make sure they stay in touch. Aidan thanks him for being a good friend. Cody arrives as Todd is eating his toast, but it doesn't last as she nicks it from his hand, before proceeding to swap his peanut butter sandwiches for her ham ones. He isn't impressed, but she plays the act perfectly. Pam bumps into Jim tinkering with the car. She thanks him for the meals he's been given Cody, but Jim tells her he knows nothing of it, and that she refused the soup they had last night. 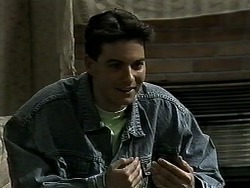 As Adam and Doug discuss Adam's job prospects over a coffee, Pam returns with news of Cody. She wonders if she's starving herself. Adam mentions the fainting incident the previous night. They wonder if she could be anorexic.